The passage of time had burdened them with years. Years, by a strange mechanism, push more quickly as time advances. Now, almost elderly, they only had each other and it seemed they did not need anything else. They had had three children who had filled them with happiness, at least for a long time, they believed to remember. Now they had a visit. Eduardo seemed to be the most normal one. He had left the house quite soon. He had married a stewardess. They travelled a lot. They did not know where he was living. They occasionally received a postcard with a strange address which they did not understand. They believed to remember their son had studied something of a very high level. They did not live in Spain. They came quite recently, didn’t they? They said to themselves. Of course. And this “of course” was slightly obvious. The visit was punctual. It had appeared, without a previous warning, a spring morning. Maybe it was that Thursday when the people from the Social Assistance brought us the little device with the button to press in case something happens to us, they said. But the important thing is that it was punctual. Magdalena, their daughter, the one in the middle of the three children, had also studied. She studied something related to Arts. They remembered this clearly since they always had their house full of extravagant visits and, what mattered the most, the whole house was always untidy and full of painting cans and strange pictures. Magdalena, did not give any signs of life. It was said she was abroad. People who think badly said she was working in a cabaret and there were some others who thought even worse. Magdalena sent a check to the bank very now and then. But they did not realize it. They were not interested in television since a long time ago. They said it was loaded by the demon. A curious expression, anyone else would say the devil. But they had the opinion that the demon walks freely. If they turned on the radio was, particularly, to be accompanied by the background noise. They were not interested in news either. Some adverts attracted their attention if they had catchy music. But they had got used to the morning visit. They had got on well with one another. So much that shortly before it arrived they turned off the radio. They did not want interferences. Anselmo was the younger child. They were greatly upset when he told them he was a homosexual. As years went on their grief had been mitigated. The loss of their memory had helped them a lot. When he arrived home with his new male couple, they received him nicely and congratulated him for having so many friends. Anselmo visited them more often. He tried to take care of them. He did not do it well, he did not have the time. The nail-sculpturing salon which he ran took him much time. It was the fresh air in the morning. They shared their food. And they played to take it out one another. It was a perfect loving triangle. When the autumn was about to finish, the days became more unpleasant. And winter was near. The visit was called Ramón. I had not told you before, had I? At present, the nice elderly couple, in their more lucid moments started to be afraid about Ramón, what it could happen if Ramón did not come back anymore. 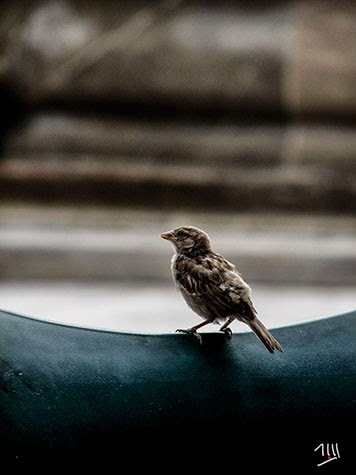 They were afraid that Ramón, the sparrow, the little sparrow could not survive the harsh winter that it was supposed to come. And if they had had the television set connected, the news would have confirmed them that the hardest winter of the last 12 years was coming. Preciosa historia y muy real, es duro y triste el abandono del que son objeto muchos padres, la falta de gratitud por la vida misma se ve reflejada en ese vivir sin reconocimiento y afecto a los seres que nos dieron la vida, y ellos cada vez con la memoria mas debil y mas ida, fijan sus afectos en quienes los acompanan, como el gorrion. Me ha conmovido, un abrazo!! And I read some of your stories. You are a wonderful caring person!